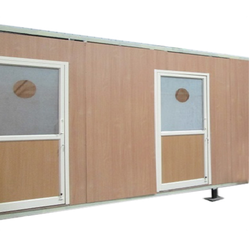 Our company has a known Name in Manufacturing of Metal Wall Partitions in various styles, these Partitions have a Zinc Coated sheet as a frame and Special Hallow metal box filled in with Honey comb or PUF which forms the partition wall. these Partitions are very strong and durable - more than this, these are offered in a variety of Powder Coated colors and Shades, and the color is guaranteed for a Minimum period of 5-6 years and can be repainted. These Partitions are Ergonomically Designed to Lend Style to the Interiors as well as Exteriors and are Manufactured Using GI Sheet (Zinc Coated Sheet), Further, these are PU Powder Coated to give Long Life and add Elegance to it and are Available in Standard Sizes to Meet and Suit to all Customer's Requirements. Looking for Wall Partitions ?